©2013 soulmachine Except where otherwise noted, This document is licensed under a Creative Commons Attribution-ShareAlike 3.0 Unported (CC BY-SA3.0) license (http://creativecommons.org/licenses/by/3.0/). 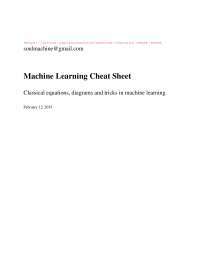 This cheat sheet contains many classical equations and diagrams on machine learning, which will help you quickly recall knowledge and ideas in machine learning. 1. Strong typed. Compared to programming languages, mathematical formulas are weakly typed. For example, X can be a set, a random variable, or a matrix. This causes difficulty in understanding the meaning of formulas. In this cheat sheet, I try my best to standardize symbols used, see section §. 2. More parentheses. 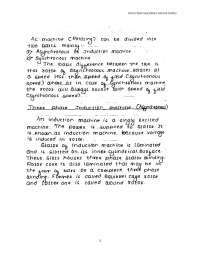 In machine learning, authors are prone to omit parentheses, brackets and braces, this usually causes ambiguity in mathematical formulas. In this cheat sheet, I use parentheses(brackets and braces) at where they are needed, to make formulas easy to understand. 3. Less thinking jumps. In many books, authors are prone to omit some steps that are trivial in his option. But it often makes readers get lost in the middle way of derivation. Wei Zhang PhD candidate at the Institute of Software, Chinese Academy of Sciences (ISCAS), Beijing, P.R.CHINA, e-mail: zh3feng@gmail.com, has written chapters of Naive Bayes and SVM. Fei Pan Master at Beijing University of Technology, Beijing, P.R.CHINA, e-mail: example@gmail.com, has written chapters of KMeans, AdaBoost. Yong Li PhD candidate at the Institute of Automation of the Chinese Academy of Sciences (CASIA), Beijing, P.R.CHINA, e-mail: liyong3forever@gmail.com, has written chapters of Logistic Regression. Jiankou Li PhD candidate at the Institute of Software, Chinese Academy of Sciences (ISCAS), Beijing, P.R.CHINA, e-mail: lijiankoucoco@163.com, has written chapters of BayesNet. It is very difficult to come up with a single, consistent notation to cover the wide variety of data, models and algorithms that we discuss. Furthermore, conventions difer between machine learning and statistics, and between different books and papers. Nevertheless, we have tried to be as consistent as possible. Below we summarize most of the notation used in this book, although individual sections may introduce new notation. Note also that the same symbol may have different meanings depending on the context, although we try to avoid this where possible. We use boldface lower-case to denote vectors, such as x, and boldface upper-case to denote matrices, such as X . We denote entries in a matrix by non-bold upper case letters, such as Xi j.
Vectors are assumed to be column vectors, unless noted otherwise. We use (x1, · · · ,xD) to denote a column vector created by stacking D scalars. If we write X = (x1, · · · ,xn), where the left hand side is a matrix, we mean to stack the xi along the columns, creating a matrix. In general, we use upper case letters to denote constants, such asC,K,M,N,T , etc. We use lower case letters as dummy indexes of the appropriate range, such as c = 1 :C to index classes, i = 1 :M to index data cases, j = 1 : N to index input features, k = 1 : K to index states or clusters, t = 1 : T to index time, etc. We use x to represent an observed data vector. In a supervised problem, we use y or y to represent the desired output label. We use z to represent a hidden variable. Sometimes we also use q to represent a hidden discrete variable. In supervised learning, a model must be represented as a conditional probability distribution P(y|x)(usually we call it classifier) or a decision function f (x). The set of classifiers(or decision functions) is called the hypothesis space of the model. Choosing a representation for a model is tantamount to choosing the hypothesis space that it can possibly learn. In the hypothesis space, an evaluation function (also called objective function or risk function) is needed to distinguish good classifiers(or decision functions) from bad ones. 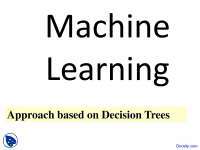 1 Domingos, P. A few useful things to know about machine learning. Commun. ACM. 55(10):7887 (2012). defined. For training example (xi,yi), the loss of predict- ing the value ŷ is L(yi, ŷ). (1.1) which is also called expected loss or risk function. which is also called empirical loss or empirical risk. 1. They should approximate the actual loss you’re trying to minimize. As was said in the other answer, the stan- dard loss functions for classification is zero-one-loss (misclassification rate) and the ones used for training classifiers are approximations of that loss. 2. The loss function should work with your intended op- timization algorithm. That’s why zero-one-loss is not used directly: it doesn’t work with gradient-based opti- mization methods since it doesn’t have a well-defined gradient (or even a subgradient, like the hinge loss for SVMs has). 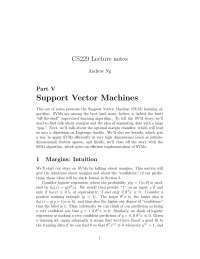 The main algorithm that optimizes the zero-one-loss directly is the old perceptron algorithm(chapter §??). Finally, we need a training algorithm(also called learn- ing algorithm) to search among the classifiers in the the hypothesis space for the highest-scoring one. The choice of optimization technique is key to the efficiency of the model. where Nk(x) is the set of k points that are closest to point x. Usually use k-d tree to accelerate the process of find- ing k nearest points. Definition 1.7. Cross validation, sometimes called rota- tion estimation, is amodel validation technique for assess- ing how the results of a statistical analysis will generalize to an independent data set3. 1. K-fold cross-validation. In k-fold cross-validation, the original sample is randomly partitioned into k equal size subsamples. Of the k subsamples, a single sub- sample is retained as the validation data for testing the model, and the remaining k 1 subsamples are used as training data. 2. 2-fold cross-validation. Also, called simple cross- validation or holdout method. This is the simplest variation of k-fold cross-validation, k=2. 3. 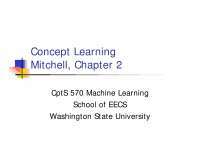 Leave-one-out cross-validation(LOOCV). k=M, the number of original samples. 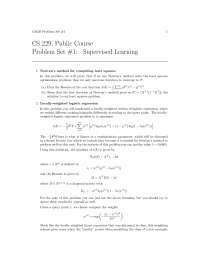 When we have a variety of models of different complex- ity (e.g., linear or logistic regression models with differ- ent degree polynomials, or KNN classifiers with different values ofK), how should we pick the right one? A natural approach is to compute the misclassification rate on the training set for each method. view, probabilities represent long run frequencies of events. For example, the above statement means that, if we flip the coin many times, we expect it to land heads about half the time. One big advantage of the Bayesian interpretation is that it can be used to model our uncertainty about events that do not have long term frequencies. For example, we might want to compute the probability that the polar ice cap will melt by 2020 CE. This event will happen zero or one times, but cannot happen repeatedly. Nevertheless, we ought to be able to quantify our uncertainty about this event. To give another machine learning oriented exam- ple, we might have observed a blip on our radar screen, and want to compute the probability distribution over the location of the corresponding target (be it a bird, plane, or missile). In all these cases, the idea of repeated trials does not make sense, but the Bayesian interpretation is valid and indeed quite natural. We shall therefore adopt the Bayesian interpretation in this book. Fortunately, the basic rules of probability theory are the same, no matter which interpretation is adopted. We denote a random event by defining a random variable X .
Descrete random variable: X can take on any value from a finite or countably infinite set. Continuous random variable: the value of X is real- valued. For descrete random variable, We denote the probability of the event that X = x by P(X = x), or just p(x) for short. Here p(x) is called a probability mass function or PMF.A probability mass function is a function that gives the probability that a discrete random variable is ex- actly equal to some value4. This satisfies the properties 0≤ p(x)≤ 1 and ∑x∈X p(x) = 1.
probability density function or PDF. A probability density function is a function that describes the rela- tive likelihood for this random variable to take on a given value5.This satisfies the properties f (x) ≥ 0 and∫ ∞ −∞ f (x)dx= 1. We denote joint CDF by F(x,y) ≜ P(X ≤ x∩Y ≤ y) = P(X ≤ x,Y ≤ y). Since the cdf F is a monotonically increasing function, it has an inverse; let us denote this by F−1. If F is the cdf of X , then F−1(α) is the value of xα such that P(X ≤ xα) = α; this is called the α quantile of F . The value F−1(0.5) is themedian of the distribution, with half of the probability mass on the left, and half on the right. The values F−1(0.25) and F1(0.75)are the lower and up- per quartiles. the mean is not defined (we will see some examples of this later). This is useful since it has the same units as X itself. In this section, we review some commonly used paramet- ric distributions defined on discrete state spaces, both fi- nite and countably infinite. Bernoulli distribution is just a special case of a Bino- mial distribution with n = 1, and so is multinoulli distri- bution as to multinomial distribution. See Table 2.1 for a summary. Table 2.1: Summary of the multinomial and related distributions. The first term is just the normalization constant, re- quired to ensure the distribution sums to 1. The Poisson distribution is often used as a model for counts of rare events like radioactive decay and traffic ac- cidents. Table 2.2: Summary of Bernoulli, binomial multinoulli and multinomial distributions. In this section we present some commonly used univariate (one-dimensional) continuous probability distributions. Table 2.3: Summary of Gaussian distribution. If X ∼ N(0,1),we say X follows a standard normal distribution. The Gaussian distribution is the most widely used dis- tribution in statistics. There are several reasons for this. 1. First, it has two parameters which are easy to interpret, and which capture some of the most basic properties of a distribution, namely its mean and variance. 2. Second,the central limit theorem (Section TODO) tells us that sums of independent random variables have an approximately Gaussian distribution, making it a good choice for modeling residual errors or noise. 3. Third, the Gaussian distribution makes the least num- ber of assumptions (has maximum entropy), subject to the constraint of having a specified mean and variance, as we show in Section TODO; this makes it a good de- fault choice in many cases. 4. Finally, it has a simple mathematical form, which re- sults in easy to implement, but often highly effective, methods, as we will see. See (Jaynes 2003, ch 7) for a more extensive discussion of why Gaussians are so widely used. Table 2.4: Summary of Student’s t-distribution. µ is the mean, σ2 > 0 is the scale parameter, and ν > 0 is called the degrees of freedom. See Figure 2.1 for some plots. The variance is only defined if ν > 2. The mean is only defined if ν > 1. As an illustration of the robustness of the Student dis- tribution, consider Figure 2.2. We see that the Gaussian is affected a lot, whereas the Student distribution hardly changes. This is because the Student has heavier tails, at least for small ν(see Figure 2.1). If ν = 1, this distribution is known as the Cauchy or Lorentz distribution. This is notable for having such heavy tails that the integral that defines the mean does not converge. To ensure finite variance, we require ν > 2. It is com- mon to use ν = 4, which gives good performance in a range of problems (Lange et al. 1989). For ν ≫ 5, the Student distribution rapidly approaches a Gaussian distri- bution and loses its robustness properties. distribution, which is always log-concave (and log-convex...) Nevertheless, both are unimodal. Table 2.5: Summary of Laplace distribution. Here µ is a location parameter and b> 0 is a scale param- eter. See Figure 2.1 for a plot. Its robustness to outliers is illustrated in Figure 2.2. It also put mores probability density at 0 than the Gaussian. This property is a useful way to encourage sparsity in a model, as we will see in Section TODO. Here a > 0 is called the shape parameter and b > 0 is called the rate parameter. See Figure 2.3 for some plots. See Figure 2.4 for plots of some beta distributions. We require a,b > 0 to ensure the distribution is integrable (i.e., to ensure B(a,b) exists). If a = b = 1, we get the uniform distirbution. If a and b are both less than 1, we get a bimodal distribution with spikes at 0 and 1; if a and b are both greater than 1, the distribution is unimodal. Fig. 2.4: Some beta distributions. The Pareto distribution is used to model the distribu- tion of quantities that exhibit long tails, also called heavy tails. As k → ∞, the distribution approaches δ (x−m). See Figure 2.5(a) for some plots. If we plot the distribution on a log-log scale, it forms a straight line, of the form log p(x) = a logx+c for some constants a and c. See Fig- ure 2.5(b) for an illustration (this is known as a power law). Fig. 2.5: (a) The Pareto distribution Pareto(x|m,k) for m= 1. (b) The pdf on a log-log scale. Given a multivariate random variable or random vec- tor 7 X ∈ RD, the joint probability distribution8 is a probability distribution that gives the probability that each of X1,X2, · · · ,XD falls in any particular range or discrete set of values specified for that variable. In the case of only two random variables, this is called a bivariate distribu- tion, but the concept generalizes to any number of random variables, giving a multivariate distribution. The joint probability distribution can be expressed ei- ther in terms of a joint cumulative distribution function or in terms of a joint probability density function (in the case of continuous variables) or joint probability mass function (in the case of discrete variables).